Had a lovely/interesting weekend. Went to Melbourne to see the folks and take in a STAR meeting. The tattoo guy never showed up but that was okay. It’s always great to reconnect with fellow writers and STAR is about the best RWA chapter in the world 🙂 While I was on my road trip I had a nice long chat with my crit partner, Jamie Farrell, who makes me giggle like crazy. She told me she needed an “assistant for her brain” cuz she’s got so much crammed up in there. Love that expression. Am seriously thinking I need my own brain assistant, as well. And of course, if she just so happed to do toilets, well, then it would be match made in Heaven. Saturday night after the STAR meeting I tagged along with my parents to Italian night at the Knights of Columbus hall. Yes, good times were had by all. I slurped down Chicken Parmigiana while listening to Mambo Italiano and That’s Amore. Makes me want to slap Moonstruck on my Netflix list now. Of course, if I cleaned out a closet, I’m sure I’d actually find my own DVD copy of the movie, because it’s one of my favorite movies, and probably Mike Geraci’s favorite comedy of all time. I just know I have it somewhere. I even quote it monthly when I go to my hairdresser. After she’s finished doing her magic, I preen in the mirror and exclaim in my best Cher/Brooklyn accent, “No more ugly grays!” Honest. I do it every time and she laughs. It’s great to have a captive audience. But the highlight of the weekend was definitely the International Mass at Ascension Catholic Church. I’m not sure when they started doing this, but apparently this is like the 6th or 7th year in a row. Basically, it’s a time for all the parishioners to show their ethnic pride. There is a “parade” of nations in which banners from all the different countries are displayed. Of course, being this a Catholic church, Ireland and Italy and all the Hispanic nations are well represented. But it was also fun to see Japan and Indonesia and lots of other places. My dad (better known as Papi) carried the Cuba banner. He also talked me into carrying the Cuban basket (baskets were later raffled off as fundraiser during the ensuing International festival). I thought “why not?” Should be fun, right? Except I had no idea we were supposed to be in native costume. So I go mass wearing what I would usually wear to mass on a warm/muggy April morning. Casual pants and short sleeved T ( along with the requisite denim jacket since this is Florida which means hot outside and incredibly cold with ac inside). Imagine my cultural pride/chagrin when I line up for the Procession of gifts and discover I am the only gift barer not in costume. Gulp. But I still took one for the team, Cuban style. Of course, I really have no idea what a “native” Cuban costume would look like. 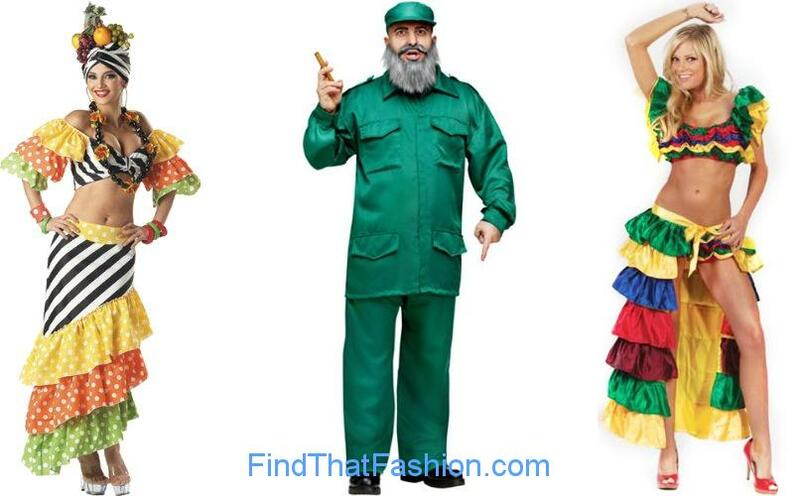 I Googled Cuban costumes and came up with this. Uh, no. No Carmen Miranda and certainly no Fidel.